to leave time to write something for the Chandeleur, which is on Saturday. It’s winter. It’s cold. Fresh produce is non-existent. Except for root vegetables. So how about a recipe perfect for all the above? Although France is (regrettably) changing, and “global” is a word that can increasingly be applied to cooking (enormous sigh! ), there is still a tendency here to cook with the seasons. Which is where traditional, regional recipes have a role to play. The southwest of France has a lot to offer. 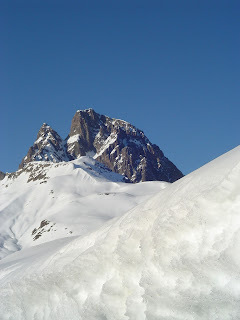 The snowy summits of the Pyrenees are a wonder to behold, still untamed and often untameable. Through its passes marched Charlemagne to fight the Moors in Spain, passes still taken by Christian pilgrims and simple hikers traveling the road to Compostella. Near the Atlantic, the Pyrenees become more calm as they enter Basque country and plunge into the sea south of Biarritz. 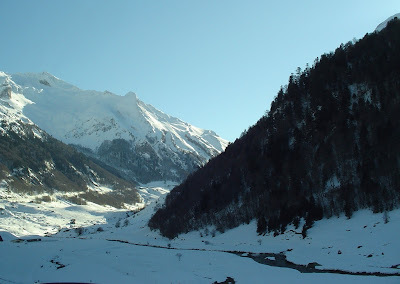 But “up-country” lie Béarn and Bigorre, renowned for ski resorts, thermal spas and, of course, Lourdes for the faithful. February’s dish is typical of this mountainous region. It’s one that would be familiar to native sons Athos, Porthos and Aramis, the Three Musketeers of Alexandre Dumas - all probably raised on garbure. (The fourth musketeer D’Artagnan, as well as Cyrano de Bergerac, were both from neighboring Gascogne, where the dish was also known.) 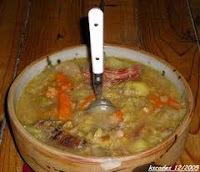 Still today, in mid-September, the town of Oloron-Saint-Marie hosts the World’s Garbure Championship, because people from Béarn take their national soup very seriously. This recipe is based on one by homeboy Chef Sébastien Sanjou, who comes from Tarbes, next door to Béarn. Garbure isn’t a dish for sissies. It’s a full-bodied soup, a meal in and of itself. French comfort food. It’s said that when the spoon stands straight up in the bowl, it’s perfect! And like all respectable soups, it’s even better the second day, when you heat it back up. But be sure to keep it in the refrigerator because cabbage is a powerful fermenting agent. A word here about beans. This recipe calls for haricots tarbais, which chef and fellow ex-pat David Lebovitz calls “the holy grail of beans”. They’re white beans that cook fairly fast because they have a thinner skin than most. That means navy beans would be best. Great Northerns would also work, but will need a bit longer to cook. If your water is hard, add a pinch of baking soda to the cooking water. And as with all dried beans, never add salt until after they’re pretty well cooked, because salt prevents the bean from softening so it can absorb water. 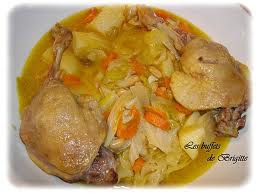 Confit de canard can be found in specialty shops. If you don’t have that possibility, just use some cooked chicken thighs for the duck. Other substitutions are olive oil for the duck fat, non-smoked pancetta for the ventrêche and spicy paprika for the piment d’espelette. There you have it. An easy soup to make, but you have to start a bit ahead, with down time between the stages. But then soup stock is always better the next day. 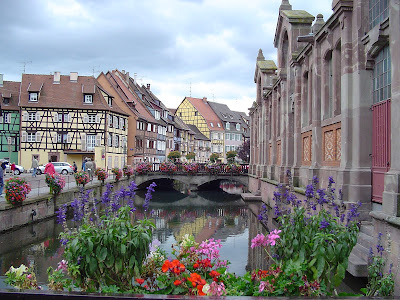 So fire up the stockpot and travel in your mind to the wilds of Béarn. 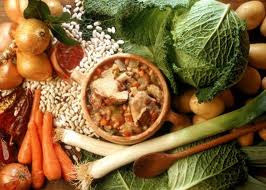 And like Porthos, when you get down to the last bit of garbure in the bottom of your bowl, add a splash of red wine to make a chabrot (shah-bro) and drink to the health of the Musketeers. - The night before: Cover the beans in cold water and let them soak in the refrigerator overnight. When you’re ready to make the soup, drain the beans and rinse them. Remove any skins or stones. - Cutting up the vegetables is important because it affects how they cook down. The carrots and the celery should be diced small (½" square) while the turnips, onion and potato can be bigger (1" cubes). The leeks should be cut diagonally into 1" long pieces and the cabbage into 1" wide strips. - Heat the duck fat (or olive oil) until it’s sizzling. Add in the turnips, carrots, onion and celery and cook until they’re soft but not colored. Add the potatoes and cabbage. Sweat them for 5-6 minutes but don’t brown. Add the leeks and cloves. Stir. Then add the beans and cook for another 5-6 minutes. Cover with water, add 2 t coarse salt (the meats will be salted already) and some fresh-ground black pepper. When it comes to a boil, lower the heat, cover and simmer for 3 hours. - Let the soup cool until you’re ready to eat. If the soup is meant for the next day, put it in the refrigerator overnight. - When it’s time to eat, reheat the soup. - When it’s hot, add the garlic, parsley and bacon into the soup. Simmer for 5-7 minutes. Then add in the rest of the meats and let it all simmer for 15 minutes. - Pour the garbure into a festive soup tureen. Toast the bread and top with sheep cheese while still warm. Sprinkle piment d’espelette on the toasts and in the soup. Serve piping hot, accompanied by a full-bodied red wine. Why not a Madiran, which comes from the region? When I went to sleep last night, the snow was about halfway gone. 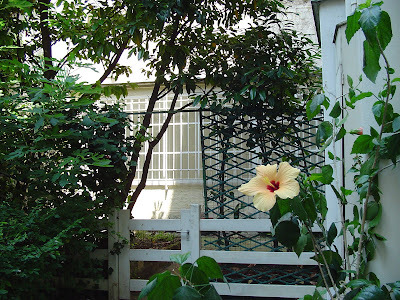 When I woke up this morning, it was bright outside the shutters and I thought “SUN!”, and smiled. SNOW EVERYWHERE! And more still coming down, softly but inexorably. 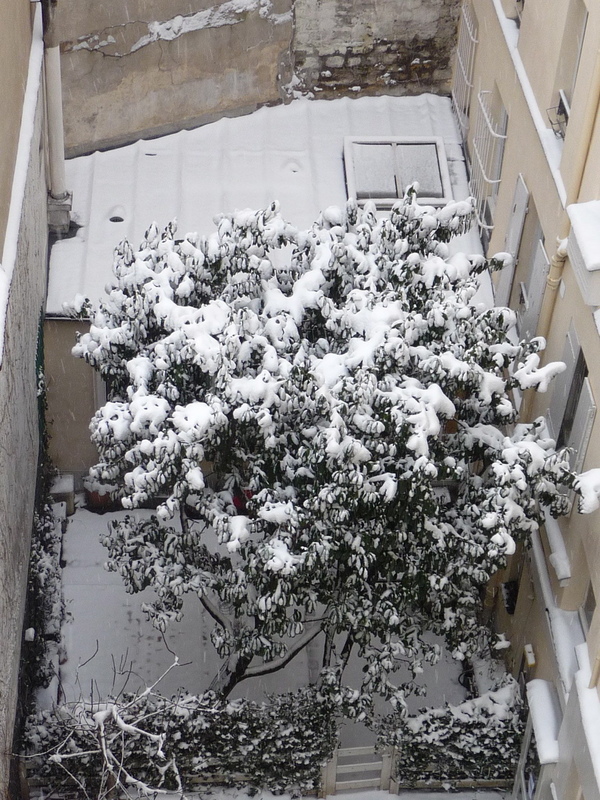 I lived in Paris for 37 straight years and since I started doing the bi-continental thing I’ve even over-wintered here some years since then, so I’ve seen snow before in the City of Light. But in all those years I could count on the fingers of one hand the times when it’s lasted on the ground more than a day. Now I need a second hand. And it’s scheduled to snow every night all week. What a brilliant time for me to leave my boots back in the old U.S. of A.! But I digress. No concierges? No snow shoveled, no salt or sand scattered on the pavements. And you can definitely not plow cobblestoned streets. Plus, in my case, no boots (see above). So I called off the Polar Expedition. Which was wise, as it turned out, because I’d have had the Devil’s own time getting home up the hill! Today, outside the window my garden is cloaked in fluffy white snow-fur. My cooking herbs are huddled in their pots. The shrubs are bent under the weight of their mantle of snow. The tree has protected some of the greenery, but one flowering vine I planted last summer isn’t made for these climes. I should have read the tag before I put it in the ground because if it were in a container, I could bring it inside. So far it looks fine, but in a week or so we’ll see what the arctic cold of these past few days and now the snow have wrought. 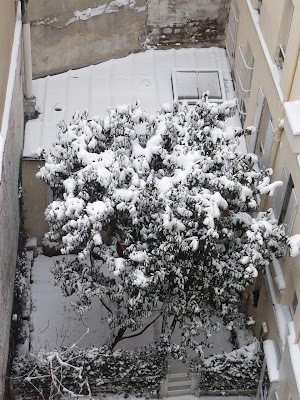 Years ago, when I lived across from the park at the bottom of the Sacré-Coeur steps, my son and his then-wife and his best friend snuck out and climbed over the fence and built a little snowman. They came back all rosy-cheeked and proud of themselves, and admired it from our window until it finished melting a few days later. I wish I had a photo of it. 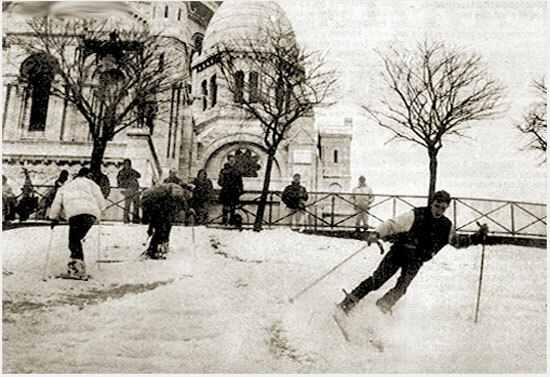 Another year people came out with skis and sleds and turned the Butte Montmartre into a winter resort. The park gates were always locked when it snowed, so the city couldn’t be sued in case of broken bones. But the fence wasn’t really high enough and people climbed over it in spite of its spiked top. The funicular that runs along the left side of the hill became the ski lift. The only thing the Alps had on us was the height of the slope. Today it ended up snowing until 5 pm. Tomorrow I’m going outside and make a snowman on my patio. After I buy some boots. But for today, I’ll just sit here on the warm side of the window and enjoy my cup of tea. At 2:12 the snowboarder rounds the curve at the corner of my street, and at 2:50 he heads downhill from the square where my local bakery stands (see Pat-a-Cake, Sept 14, 2012). This was shot in December of 2010, but it’s basically the same thing this time around. Not a brilliant start. The flight itself had been ordinary, except for some turbulence - during the meal, of course - which got so bad they interrupted the dinner service. I even had to stop watching the movie because we were bouncing around so much I started to feel seasick. Or maybe that was because my stomach had been on empty for hours. 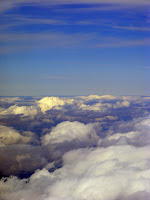 Anyway, we were descending through the clouds, and when you could finally see through them a bit, there was the ground! Ceiling: 10 feet, max. I’m sure the pilot could see nothing, which is always a scarey thought. We landed on time at 11:10. Things went smoothly for a while. We were actually allowed to dock at the terminal instead of having to climb down that long stairway onto the tarmac and be bussed, bouncily, to the terminal, as has been the case for a few years now. (They’ve finally completed repairs to Terminal E, part of which caved in shortly after opening, killing one poor passenger.) There was an amazingly minimal line at customs, and my suitcase appeared about 10 minutes after I got to baggage claim. It was barely 11:30. I know Terminal E like the back of my hand and proceeded unfailingly to the taxi stand. There were some of those scabs who try to offer their “taxi” services inside, and I told them “no thanks” without even breaking step. Often they're Russians with meter-less cars, trying to rip you off. “There aren’t any cabs,” one of them yelled after me. Walking back through the halls, there were the same “taxi” drivers milling about. One of them must have recognized me from a few minutes earlier. He smiled sneeringly at me. I asked how much, out of sheer curiosity. “200 euros,” came the answer (that’s about $265) - for what’s usually a 50-60 euro trip, with tip. ”She couldn’t afford it,” said another, his voice dripping with sarcasm. Airport buses all come in close to the taxi stand, and Platform B is the bus to Opéra. It’s the only one - to my knowledge - that is run by the bus company and not by the airport, which might explain the difference in price - only 10 euros compared to 17 - and frequency. It’s also handiest for my destination. There was no one there, so I figured I must have just missed the last bus but that there would be another fairly soon. The next bus put in its appearance an hour and a half later. At least I was at the front of the line - and so inside the bus shelter - because the fog turned to rain. Gradually people crowded in until we were sardined under the canopy and the briskness of 7°C (45°F), welcome after the below-freezing cold of Michigan and the stuffiness of the plane, became a chill rising from wet feet all the way up my backbone. After about half an hour watching airport buses come and go to other destinations, not to mention the colorful Disneyland buses that were plentiful, another impediment to the advance on Paris developed. To add to the merriment, buses have to come down a ramp and make a 90° turn to reach the platforms. But some idiot had parked his van near the bottom of the ramp, halfway blocking the turn. Result: the buses couldn't get by. Inexorably, the access ramp clogged up with them, horns started honking, but no tow truck was sent out and no police ticketed the vehicle, so I guess the driver was justified to exercise his Right to Commit Creative Parking. All this went on for an additional half an hour, and we could see several Opéra buses go by at the departure level above our heads, but they knew they couldn’t reach the platform below so they must have just headed back to Paris. By the time the van drove off, freeing the flow of bus arrivals - none of them mine - I’d been in the line for an hour. After an additional half-hour, now chilled to the bone by the humidity, a bus did appear and we all trudged on, except for a handful of late arrivals who were left mournfully behind. All the seats were taken and the aisle was full of people standing, or sitting on their suitcases. At 1:30 off we went, Paris-bound. I thought my troubles were over. 30 minutes and I’d be at Opéra, where I could walk to the nearby Métro and be on my final lap. “Erreur,” as the French would say. The taxi strike was not just at the airport. I found that out when the driver got off the expressway. After inching along from traffic jam to traffic jam, and now blocked at a red light, he stood up and shouted out. “For those of you who speak French, which means almost no one...” he announced, and went on to explain that the irate drivers were holding an Opération Escargot, a snail crawl on highways all over the country, and especially in and around the capital. The expressway was completely blocked. Instead of a 30-minute trip in from the airport, it took an hour and a half to reach our destination, during which time I nodded off several times and the young couple next to me missed their 3:00 train to Cherbourg. At least the rain had almost stopped during the bus ride. I trudged through the mist to the Métro, bumping my suitcase down the steps, and fished out an old ticket left from the last trip, a trick I learned a long time ago. There was an escalator down to the subway platform and the train came within 2 minutes, as posted, and it was a straight shot to my stop. Small mercies. “Please, Lord,” I prayed in my head. “Let the elevators be running. At least one of them!” And one was. 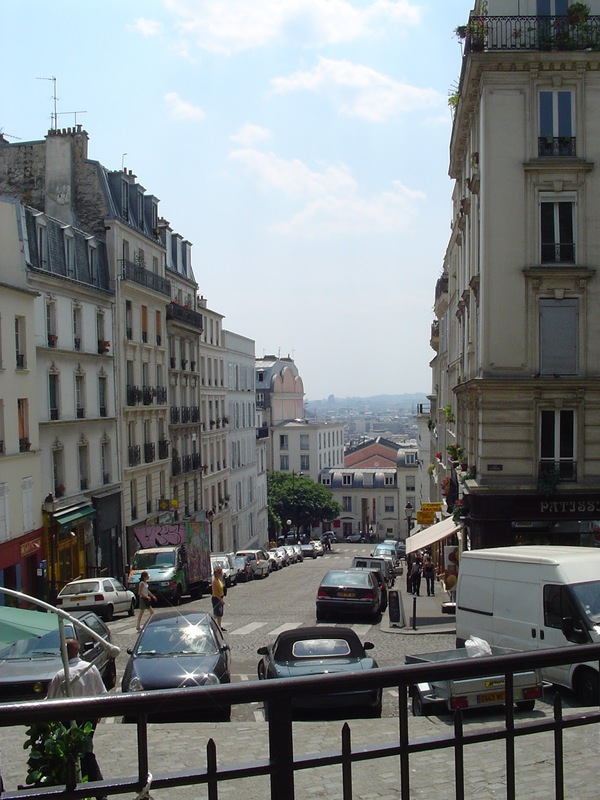 (The Abbesses stop is the deepest in all of Paris, 280 steps that I once had to carry my suitcase up until a young man rescued me in mid-ascension and carried it the rest of the way.) When the elevator reaches the top, there are still about 30 steps left to street-level, but I made it with help from some ladies I’d convinced to wait for the elevator by telling them how many stairs lie ahead. It was only fair. It was still almost raining, but I decided to pull the suitcase up the final steep slope of Montmartre and brave the 10 steps to the cobblestoned square at the corner of my street. “I can do this,” I kept telling myself, but the lack of sleep over the past two or three days had taken its toll. And then every good deed I have ever done over my entire lifetime paid off. The little local hill-climbing Montmartrobus passed by, heading for the bus stop just ahead. I managed to break into a trot somehow, but it started to pull out as I drew even. I banged on the side of the bus, and the driver stopped. It seemed a moral victory somehow, the hand of a Great and Magnanimous Supreme Being who said, “this poor soul has had enough”. And I had. 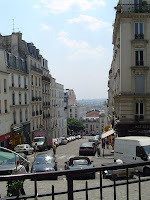 The mini-bus wound its way back and forth, up and down the narrow streets of my neighborhood until it reached the stop at the Correct Altitude for my building and I got off, tossing a heartfelt “Merci bien!” over my shoulder to the driver. Down the passage, around the corner, suitcase bouncing over cobblestones desperately in need of a repaving. Now remember the new door code. Then drag my tired self through three doors and across the courtyard, through my sticking-in-the-humidity gate and I’m home. And it only took me 4½ hours. 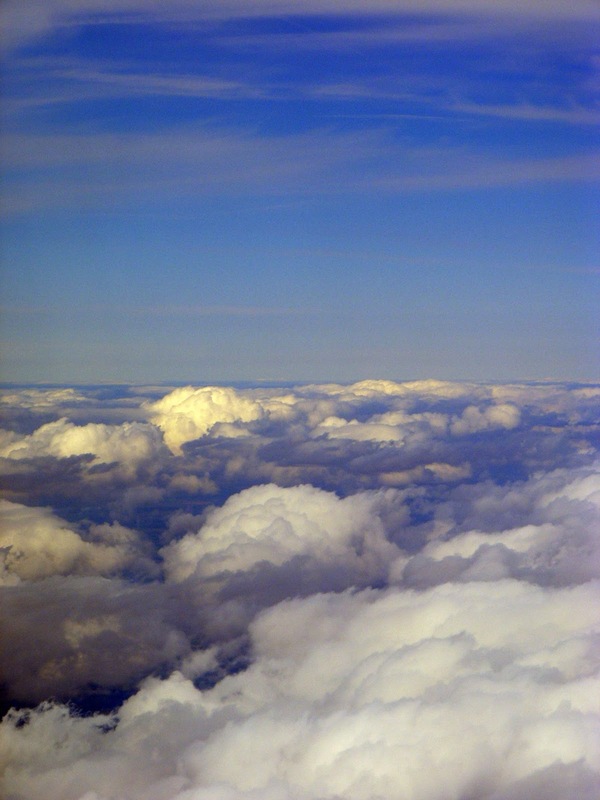 7½ hours to zip across the Atlantic, 4½ hours to slog in from the airport. A new record, and I don’t mean that in a good way. New Year’s Eve has come and gone, with its deluge of oysters and smoked salmon and foie gras, all washed down with lots of vintage wine and finishing with pâtisseries, chocolats and champagne. At least in France. But after all the expense of Christmas and New Year, the pocketbook needs a rest. And the waistline needs a rest as well. So here’s an inexpensive dish that is still filling, and perfect for a cold winter’s day: quiche lorraine. Who was this Lorraine? Well, it’s not a Who but a What. Lorraine is one of the 27 regions of France, and located in the east. When Charlemagne died, he divided up his realm between his three grandsons. (He outlived his sons.) One of them, Lothair, got this part, and it became known as the medieval German kingdom of Lothringen. As of 1766, it became part of France under King Louis XV and the name was changed to Lorraine, although the northern part remained largely German-speaking. And French it remained until France was defeated in the Franco-Prussian War and Lorraine was annexed by Germany, along with Alsace. It remained part of Germany for almost half a century until the Treaty of Versailles ended World War I and it was returned. Then throughout all six years of World War II, Germany took both regions back yet again as an integral part of the Vaterland, and French language and culture became grounds for distrust, persecution, and even death. In spite of this tug-of-war, Lorraine has strong French ties. The capital, Nancy, is the home of Art Nouveau, a genre abundantly found in the city’s architecture. The croix lorraine - Cross of Lorraine, with its double bars - became the emblem of the Free French Forces during World War II. And France’s modern-day hero General Charles de Gaulle, who led those Forces, is buried in Lorraine, in Colombey-les-Deux-Eglises. So much for Lorraine? But what about that other word? 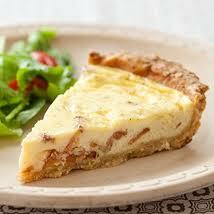 Quiche comes from the German kuchen, which means "cake". Quiches were mentioned as far back as 1550, when they were served to the royal court in Nancy, the capital of Lorraine. They were cooked in cast iron skillets and had a slightly different look. The recipe as we know it today dates back only to the 19th century, but it’s been very popular throughout the country ever since... and even abroad. So there you have it: quiche lorraine (pronounced "keesh low-ren"). Try it; you’ll like it. And don’t be afraid to experiment. There are many variations of this recipe but this is the original, aka traditional, one. A true cook from Lorraine will use all cream in making a quiche; only the faint-of-heart substitute half milk. Some people lay sliced Emmenthal or Gruyère cheese on the pastry shell before adding the bacon, but that would make it a quiche vosgienne, from the Vosges mountain region farther south. Others add thinly-sliced sautéed onions, but that would make it a quiche alsacienne, the other French region Germany and France squabbled over. You can do as you please, unless you’re a purist. That’s the beauty of the quiche lorraine. - Preheat the oven to 375°F (190°C). - While you’re preparing the filling, line the bottom of the shell with aluminum foil and pour in a layer of dry beans. This will keep it from puckering. Bake in the middle of the oven at 400°F (200°C) for 8-9 minutes, then remove the beans and foil, prick the bottom and bake for an additional 2-3 minutes. - In the meantime, brown the diced bacon lightly. When it’s brown and the pastry shell is cooked, sprinkle the bacon evenly into the bottom of the shell. - Beat the eggs, the cream and the seasonings together until they’re well blended. Pour into the pre-cooked pastry over the bacon. Don’t fill it more than 3/4, to allow for puffing. - Set in the upper third of the oven and bake for 25-30 minutes, or until it has puffed up and browned. A knife should come out clean when inserted into the center of the quiche, but the custard should still move a bit. P.S. If you need a bigger quiche to serve 6-8, use a 10" shell and increase the ingredients by ½.
P.P.S. You can precook the shell ahead of time and refrigerate the filling. Half an hour ahead of time, put it all together. P.P.P.S. For party needs, you can make these as tartlets (probably 6). Keep an eye on the cooking time, as they may cook faster, given their small size.